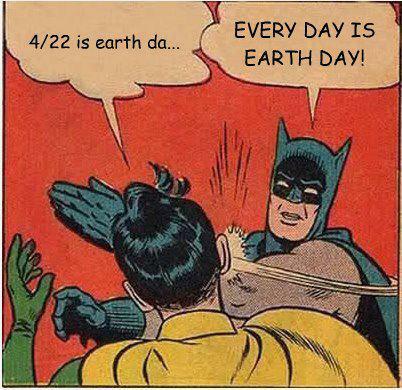 Earth Day is not about plating a tree, or bringing your own cup, or going to some festival. Sure, these things are great, and important, but it’s bigger than that. Earth Day allows us to stop and pay respect to this giant being that sustains all we do. I mean, really think about that, there really is no ‘us’ without Earth. So yes, we give her one day where we are all supposed to stop and say thank you, just like we do for notable people who have changed history for the better. One day, everyone living on this planet will also be a part of history. The path this history takes is up to us. We make choices everyday. Thousands of choices. Where to go, what to eat, what to wear, how to get places. It goes on and on. Every time we make a choice we cast a vote. We are saying yes to a product, a way of life. And the choices we make have a consequence for Earth. We all know there are a myriad of problems. Deforestation, habitat destruction, drought, overpopulation, rising sea levels, oceans full of plastic, etc. Luckily, there are so many people and organizations working on solutions. But we cannot just think there are ‘others’ working on these problems that are also affecting ‘others’. No. That time is over. The state of the Earth is everyone’s problem. But it is also everyone’s opportunity. I always use my reusable cup & other utensils, recycle and compost everything I can, drive a low emission vehicle, grow my own food, drink tap water from a stainless steel bottle, turn off lights, always have my reusable bags, have a ‘green’ cell phone company, sign petitions, boycott certain companies, buy organic and local. I challenge you to find a place in your life where you can do more. A place where you can educate yourself, your family or friends about the issues that affect us all and what things large or small we can do to help. Parents, teachers, commuters, shoppers, bloggers, artists, no matter what role in life you claim, everyone has this opportunity. Tonight, say thank you to Earth. (And go see the meteor show she’s putting on to celebrate, best visible tonight). And challenge yourself to make tangible change for the better. Because, really, where are we without Earth?